Historic landscapes offer compelling narratives about the origins of a place, as well as the hopes, dreams and accomplishments of the people that shaped them. Set in the foothills overlooking the picturesque east-end of the Ojai Valley, Hermitage Ranch is bordered by the Los Padres National Forest and protected from further development. This bucolic ranch of 51 acres is gated and combines residential and agricultural elements into a golden Southern California enclave. The area’s unique rolling hills are covered with old growth oaks, sycamores, eucalyptus trees and the fertile soil is site of very productive and profitable avocado and citrus orchards. A century old barn, two ponds and a river complete the agrarian California ranch lifestyle. Ojai has a very rich history. The Chumash people settled in the Ojai region about 3,000 years ago. With the establishment of the missions, the first Spanish land grant was granted in 1837 for rancho use. Edward Libbey, founder of the Libbey Glass Company in Ohio, came to the Valley in 1908. He knew that he had found his paradise. Libbey began developing the rustic town into one of beauty. Libbey hired such architects as Myron Hunt, George Washington Smith, Richard Requa and Wallace Neff to create his idyllic vision. He helped design and finance the downtown area. The graceful Spanish-style arcade, bell tower and pergola seen today are the same buildings among others that Libbey helped to design and build. City restrictions continue to support the architectural roots of this unique town. 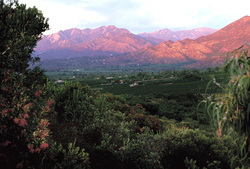 The Ojai Valley is lined up with an east-west mountain range and is one of the few areas in the world to have the “Pink Moment” occur at sunset. As the rays of the setting sun hit the mountains, the fading sunlight creates a brilliant shade of pink on the Topatopa Bluffs. This phenomenon creates breathtaking pink sunsets.